How To Use Fear To Boost Trading Performance? One, even with all the advices from pros and experts, market is highly affected by emotions. And THAT IS GOOD. Because if that would not have been the case and that the market isn’t related to cognitive biases, there would have been way less opportunities to make profits from trades. So the fact that stock market is swayed by emotions brings an awful lot of opportunities for the smart traders. Two, fear is the “right” emotion that we mentioned about earlier. Often considered a twin to greed, fear is a natural protective mechanism that can help you turn trading opportunities into big profits; that, only if you know how to pull all the strings perfectly. Contrary to the popular belief, being fearful isn’t always a wrong thing. In fact, when looking into the success stories of many successful people, one can easily identify fear being the driving force behind their motivation. One fears regrets so he is doing #YOLO activities in Europe. One fears oblivion so she sings (beautifully) on her YouTube channel. One fears poverty so he is working hard to get a job in any top company. Fear is the fuel behind their motivation. The same theory applies, up to an extent, in trading. The market is beyond anyone’s control. Even when fully informed about all the possible theories, market can still be largely unpredictable. This should bring a healthy dose of fears in every trader. Every trader must have slight fear that triggers their following actions. What is that next action is really the most important thing here. Because at the end of the day, fear isn’t a bad thing—it is how we respond to that fear that makes or breaks the deal for us. 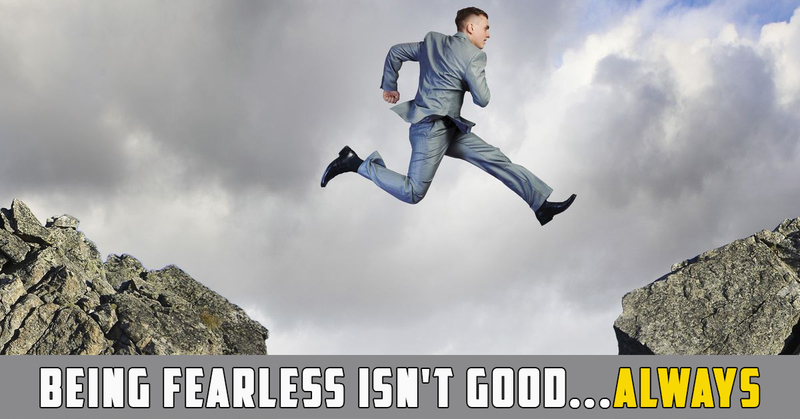 When an enthusiast opts for one of the best stock market trading courses , doing away with fear becomes easier. Like, in the example above, afraid of regrets, the person didn’t just sit in his home and mope. He went ahead to conquer that fear. This is just as true in the trading scene. The traders must use their fear constructively rather than destructively. Let’s look at this in a more practical way. For example, you’re afraid of losing money in your next trades. Now you can act destructively by ignoring the general trading rules, cutting profits short and tightening stop-loss prematurely. Or your next set of action could be a lot more constructive. You can analytically identify the dangers of a large position and take a small position.